Heavy rubber choker with holes. Closing on one buckle. Height of collar 3 cm.Specification: ru.. Heavy rubber choker with rivets. Closing on one buckle. Height of collar 3 cm.Specification: r.. Heavy rubber choker with O ring. Closing on one buckle. Height of collar 3 cm.Specification: r.. Solid rubber collar with D-ring. Closing on one buckle. Height of collar 6 cm.Specification: r.. Solid rubber collar with bow. Closing on one buckle. 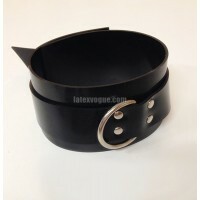 Height of collar 6 cm.Specification: rubber 2 m.. Shaped solid rubber collar with cross. Closing on one buckle. Height of collar 8 cm.Specification: r.. Shaped solid rubber collar with D-ring. Closing on one buckle. Height of collar 8 cm.Specification: .. Solid fixation neck collar with D-ring. Two buckles on the back. Collar height 8 cm. With loops arou.. Solid fixation neck collar with D-ring. Three buckles on the back. Collar height 8 cm. With loops ar.. Solid rubber collar with bow. Closing on one buckle. Height of belt 3 cm.Specification: rubber 2 mm,..